My wife really wanted to participate in a local 24-hour filmmaking marathon competition last weekend so, naturally, she wanted me to shoot and edit for her. From 10am Friday morning until 10am Saturday morning, 30 teams of (up to) five members each made 3-minute films with the following criteria: The theme of the movie had to be “anniversary” and there had to be a cake, and the line of dialogue “I really wanted to…” in the film. “Another Year” is what we were able to create in that time. With planning and buying the props we needed, we didn’t start shooting until about 4:30pm and wrapped at about 11pm. The shoot was pretty simple but was complicated a bit on my end with the type of lights we were using and the two bokeh-forming-words effect we wanted to do. 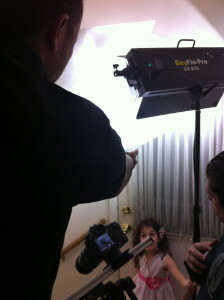 We were using some Day-Flo light units (which are essentially KinoFlo-type lights) that my friend let me borrow. They are daylight-balanced units and don’t have very much or any control to them. They have these silver-reflector barndoors that seem to spread light rather than cut them. But they put out a surprising amount of light—which came in handy for the bokeh-forming-words shots. Being so uncontrollable and not having any grip equipment to help shape the light, I used the lights sparingly. The shoot went fairly quick, given a slow start. But there weren’t very many shots to get so that made it easier. Once we wrapped, it took about 8 hours to transcode, edit, sound mix, add score (music courtesy of the great Russ Whitelock), and export the 3 minute piece. We got the film in just before 10am and judging happened a week later at a screening of all 30 submission films. We received and Honorable Mention award for it.